A Texas grandmother who used a box cutter to fight off a pair of robbers at her Subway restaurant may have a new title: Houston's Toughest Abuela. Recently released video of the Sept. 22 robbery at a Subway on Westheimer Road shows two men in hoodies jump over the sandwich franchise's counter and confront 44-year-old Guadalupe Rojas, KPRC-TV reported. Rojas grabbed a box cutter and held her ground, refusing to turn over any cash. Security video shows one of the men grabbing a pan and striking Rojas over the head before punching her repeatedly. The station reported Rojas, who stands 4 feet, 9 inches tall, slashed one of the robbers. According to KPRC, Houston police are searching for the men in the video. 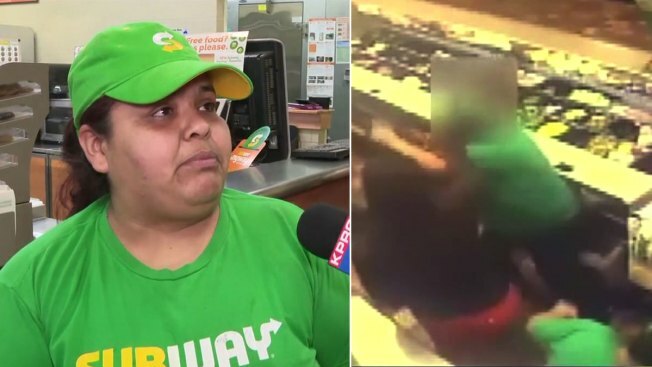 "[The attack] taught me that I had to defend my family, because that is how I feel, that Subway is my family," said Rojas, who has worked at the restaurant for six years. "I was shocked to see my mom in that way," Aurelia Mejia told KPRC. Her sister, Edith, said they were both "super proud" of the grandmother of nine. The report said Rojas did not receive a raise for her actions, but she did receive more hours.